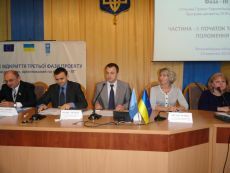 Distinguished attendees included Mr.Vadym Merikov, Head of Mykolaiv Oblast State Administration, Taras Kremin, Head of Oblast Council, Ms. Oksana Remiga, UNDP in Ukraine Senior Programme Manager, Ms. Olena Ruditch, Community Development Specialist of joint EU/UNDP Project “Community Based Approach”, leadership of rayon state administrations and rayon councils; and heads of village and city councils. «Project contributes to our development and energy self-sufficiency. It also helps our communities to become more active and effective in implementation of their initiatives. In terms of the decentralization agenda, local authorities will be given preference in the organs and system of governance. I am very pleased that communities, not authorities, will re-energised and give second life to local settlements. 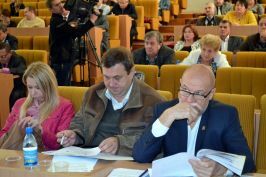 I hope that the third phase of the project will give a good start for noble deeds in the name of our communities», underlined in the welcoming speech the Head of Oblast Council Taras Kremin. 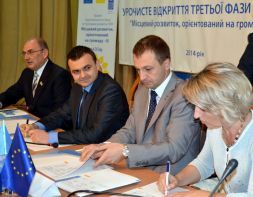 Implementation of the first phase of CBA Project commenced in Mykolayv region during October 2008. First phase was succeeded by a second phase in July 2011. Over these two phases, 82717 men, women and children of the region have benefitted from improvement in 63 schools/kindergartens, 7 healthposts, 28 water supply, 4 street-lightning, 6 agricultural service cooperatives and so on. This happened through joint effort of the citizens, oblast/rayon/local level governments, CBA Project and the private sponsors.